"Through your music we can transcend all the evil in the universe and bring people together. That's a precious gift, Minmay." Disc 6 of Robotech ends off The Macross Saga, the first of the three parts that make up the series, whose animation is derived from the original Japanese anime, Macross. Thus far we have witnessed the launching of the Super Dimensional Fortress, a spacecraft that crashed on Earth and was refurbished by humans, and the subsequent conflict that followed as a race of giant aliens, the Zentraedi, came looking for the ship. A full scale war took place between Earth and the aliens, some of whom became sympathetic to the Earth after hearing young Lynn Minmay's singing—a phenomenon unknown in Zentraedi experience. Collaborating with their new Earth allies, Zentraedi forces, under General Breetai, had fought against the massive main fleet, devastating Earth and leaving it as a barren wasteland. While some of the Zentraedi were able to coexist with humans, their warlike nature led to skirmishes on the new Earth, with the remaining Zentraedi opposition under Lord Khyron continues to plot the destruction of the human race, and what remains of the SDF-1. The only thing standing in his way is his group's lack of protoculture, a power source that they rely upon to produce their weapons and power their ships. As disc 6 opens, Rick is sent to New Detroit to secure the last remaining protoculture chamber, but meets unexpected resistance from Lynn Kyle, who wants the chamber left in civilian hands. Lord Khyron seizes the opportunity to liberate the chamber from the Micronians, as it is the only method the Zentraedi have of returning to their full size. In the process, Minmay and Kyle are taken hostage and offered up in exchange for command of the SDF-1. Rick is called to the rescue, which spark's Minmay's feelings for him once again, leaving Lisa in an awkward position. As the remainder of The Macross Saga unfolds, the relationships between Minmay, Lisa and Rick may ultimately be decided, as Khyron plans his last assault on humankind, and set us up for the next stage, The Robotech Masters. As has been the case with this entire series, the voice acting is my primary complaint; it is too reserved at times for the action that is taking place. The storyline also develops a few holes during these episodes, with some glaring continuity issues, some of which could be expected by the upcoming switch to a completely different animation style; however, some could easily have been avoided. The relationships are more fleshed out, which was nice for a change, but I'm hoping my assumptions that these characters will be simply dropped in the next installments. We still get plenty of battle sequences, though they are not on as big a scale as we have seen previously. I am looking forward to more. Image Transfer Review: Disc 6 of Robotech is again fairly consistent with its predecessors, however these episodes seem to exhibit almost continual color shifts throughout each episode, even within scenes. The digital graininess remains, though to a lesser degree than some of the discs. Colors vary significantly in saturation and hue between shots, leaving the same characters with vastly different appearances from shot to shot. Credit sequences suffer the most with massive rainbowing and aliasing, and the image does appear well zoomed in at times. Watchable, but not that impressive. Audio Transfer Review: Mono audio is presentable, but suffers from occasional distortions. Frequency and dynamic range is limited. Dialogue is easily discernable, with most of the complaints originating in the source. Extras Review: Discs 5 and 6 are available individually or in a box set containing an additional disc of extras, so supplements are limited to trailers for Gasaraki, Burn Up Excess, Generator Gawl, Gunsmith Cats, Princess Nine and A.D. Police, accessable from the trailers submenu. 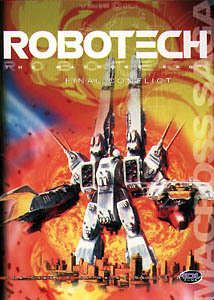 The highly popular Robotech series continues to entertain despite transfer quality issues. Those concerned over supplemental features may wish to look at the box sets available instead individual discs.